The work that we produce as illustrators falls under the category of Intellectual Property when it comes to copyright definition and legal protection. The term “Intellectual Property” began to be used in the mid 19th century in reference to early copyright statutes and patent law. However, it was not until the late 20th century that the concept was adapted in a broad sense. Intellectual property refers to “creations of the mind”. Recognition and protection of creations of the mind is intended to stimulate creativity towards the advancement of research within a field for recognition and/or financial gain. Illustration, design, and art fall within this creatively based classification. Intellectual property is divided into two categories: The first is copyright classified works, which includes artistic works such as illustrations, drawings, paintings, designs, photographs, and sculptures; literary writings; musical works; theatrical works; software; and architectural designs: Although not part of this discussion, the second category consists of industrial classified works. So where does the work of illustrators, designers, and artists fit in to the definition of intellectual property? Works of art, musical compositions, literary works, phrases, designs, discoveries, inventions and other forms of creation are known as “Intangible Assets”. Intangible assets are defined as identifiable assets that cannot necessarily be measured but none-the-less were created through the application of a particular time and effort. Sometimes referred to as “Invisible Assets”, these assets must also be original in nature, in other words, not derivative of someone else’s intellectual property. 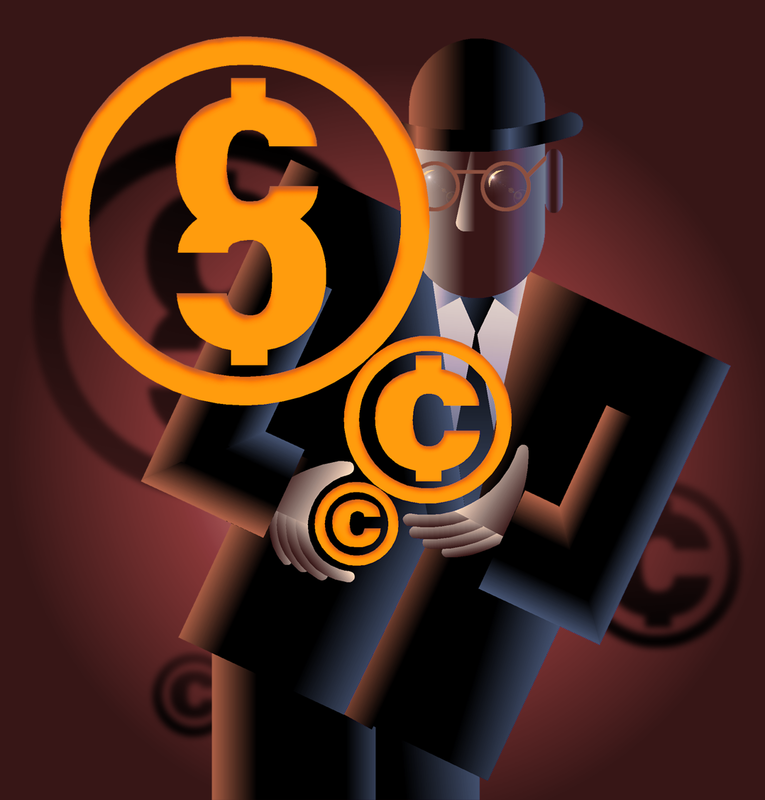 Intellectual property encourages the disclosure of intangible assets involving creative investigation to the public through publication and distribution of new discoveries, rather than keeping them a “trade secret”. It also acknowledges commercial success as a motivation for the presentation of creative works. Intangible assets are divided into two categories: The first is “legal intangibles”, which includes copyrighted works such as works of art, designs, service marks, trademarks, formulas, and patents; generally speaking, assets that are attached to a fixed state of display. The second category is “competitive intangibles”, which includes knowledge-based activities such as working methods, strategies, collaborative discoveries, and subject knowledge. Competitive intangibles directly influence the creation and effectiveness of legal intangibles, and therefore are intellectual property. So how do intangible assets relate to the work of illustrators and artists? Illustrators and artists not only produce copyrightable works, but many of those works are produced using unique individual approaches to materials, or even unique combinations of materials. Additionally, nearly everyone creating original artwork uses a very personalized working method. This is where the descriptive term “intangible” comes in. Here’s an example of how important an intangible asset can be. Art produced by Jackson Pollack has become a “tangible asset”, each painting he produced may be worth millions of dollars. However, because a very personal intangible asset, his indelible way of laying down paint relating to his own physicality and emotional state, died when he died, his artistic contributions cannot carry on. For traditional media illustrators, it may be the flick of the tip of a brush, or a unique color palette, etc. For digital media illustrators, it may be a custom designed brush, a unique color scheme, or a sequence of operations, etc. Quantifying an expressive way of applying paint, or how reference sketches are evolved to produce a finished work would indeed be very problematic. So, for the sake of simplicity they are classified as the intangible assets of a work of art. “Intellectual Capital”, which is sometimes confused for intellectual capital, in so far as definitions exist at this time, is an investment measure of the valuation of a company. The measure takes the form of this equation: Tangible assets minus the market value of a company. In other words, the intangible gap between hard assets and the assessed value of a company is a company’s intellectual capital, i.e., it’s workforce knowledge. Hardly ever acknowledged, intellectual property and intangible assets, comprise a portion of this determination for the value of the intellectual capital of a company. Here’s an example of how important intellectual capital can be. When Steve Jobs had to step down as CEO of Apple, the investment valuation of the company fell markedly. It was the result of a one-person shift in personnel. When Jobs died the value of Apple's stock dropped again. CEO’s come and go at corporations without any effect on the bottom line, but that was not the case with Jobs and Apple. It was his ability to generate intellectual property and his worth as a visionary contributor of intangible assets that increased the company's value. Copyright means the right to copy. 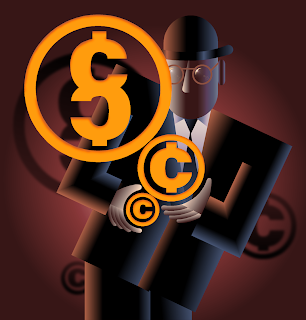 “Copyright protection subsists … in original works of authorship fixed in any tangible medium of expression.” All art is copyrighted from the moment it is produced or becomes a fixed copy. Copyrights cover, works of art, designs, literary works, musical compositions, sound recordings, theatrical works, motion pictures, architectural works, and software. A patent is a legal property right for an invention given to the inventor to protect the right of the inventor to capitalize on their invention for a limited period of time. The invention may take the form of a product or process. The property right is granted to the inventor in exchange for a full description of how to construct or perform the invention. Patent categories are utility patents, design patents, and plant patents. A name, word, phrase, image, symbol, design, logo, or any combination of these elements can become a trademark. The purpose of a trademark is to differentiate the goods of a company or individual from other like situations. A trademark is a unique identifier used to aid consumers in recognizing the particular source of goods of an organization or individual. A service mark is a name, word, phrase, image, symbol, design, logo, or any combination of these elements. It is essentially the same as a trademark except it relates to only to services. The purpose of a service mark is to differentiate the services of a company or individual from other like situations. 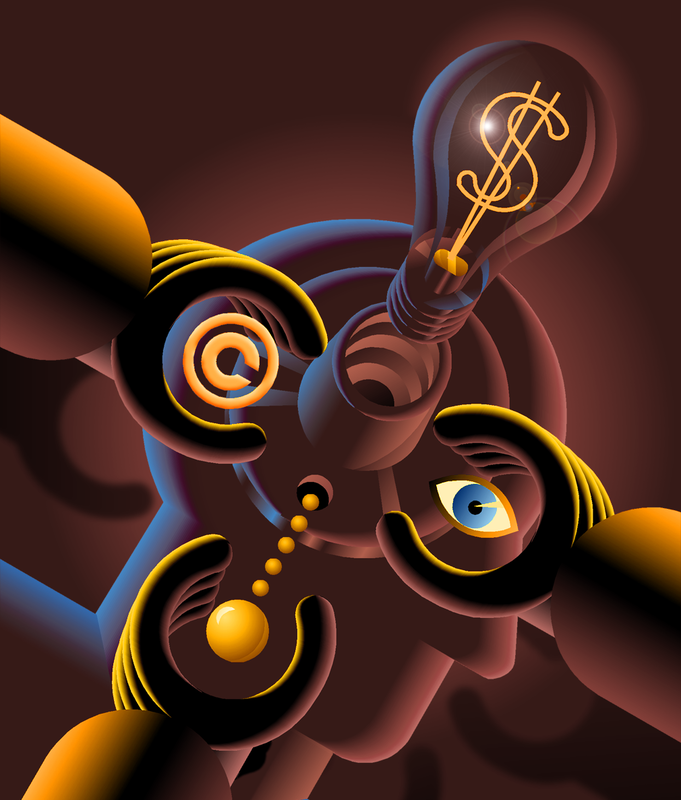 Illustrators, designers, and artists sometimes fail to recognize the value of the intangible aspects that contribute to the creation of their intellectual property, i.e., their work. Artists should acknowledge, through a self-appreciation and appraisal, not only what they produce, but also how their artwork comes to reach its finished state. And finally, to realize that there may be, not just an intrinsic value to it, but a financial value as well.